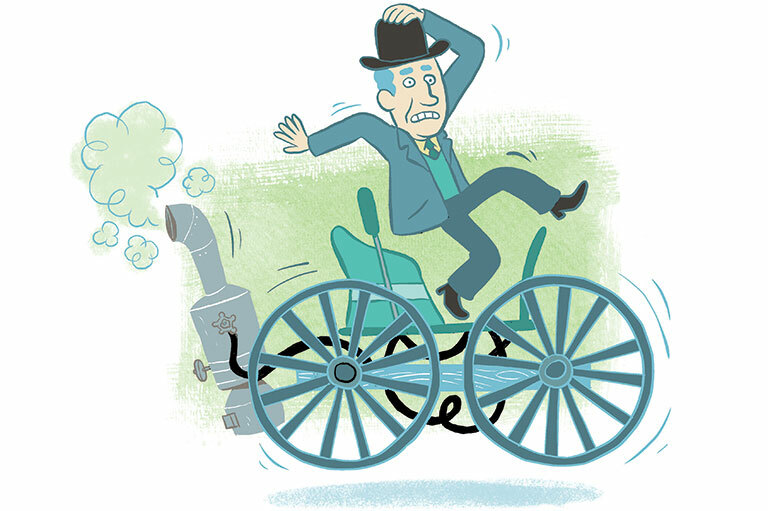 The “steam pleasure palace” was a nickname for Canada’s very first self-propelled car. A Quebec watchmaker named Henry Seth Taylor built this contraption in the 1860s. Powered by steam, it had a single seat and travelled up to 24 kilometres per hour. But it had some problems. First of all, its engine got VERY hot when it was running, so the driver always risked scalding his backside. Worse, the car didn’t have any brakes! This proved to be its downfall. One day, Taylor lost control of his steam pleasure palace while going down a hill. He managed to jump to safety just before the car was wrecked — for good. Alexander Graham Bell is best known for inventing the telephone. 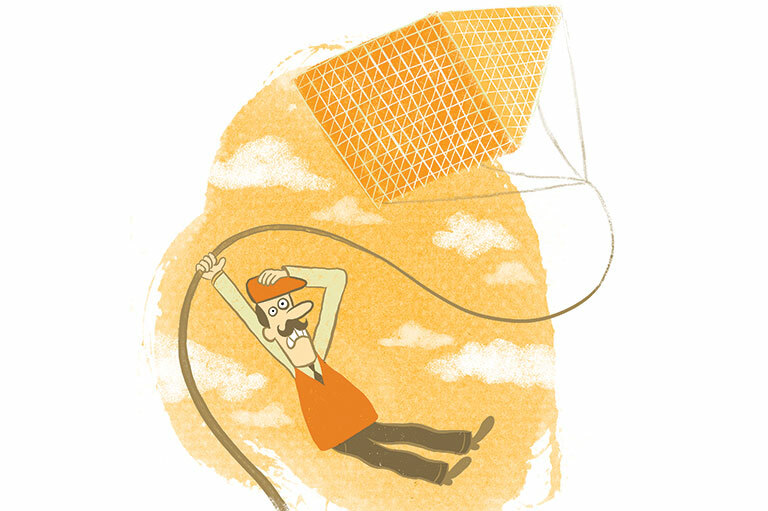 But he was also behind the creation of some of the world’s first flying machines — including human-carrying kites! Bell designed a variety of kites at his summer home in Baddeck, Nova Scotia. He wanted to figure out which kite shape would be strong enough to carry a person in the air. Eventually he found that the best shape was the tetrahedron — a triangular pyramid. In 1905, Bell built a tetrahedral kite called the Frost King, which accidentally lifted one of its handlers nine metres above the ground! A couple years later, Bell and his associates built a larger tetrahedral kite, the Cygnet. This one flew for seven minutes at a height of 51 metres… with a man onboard! 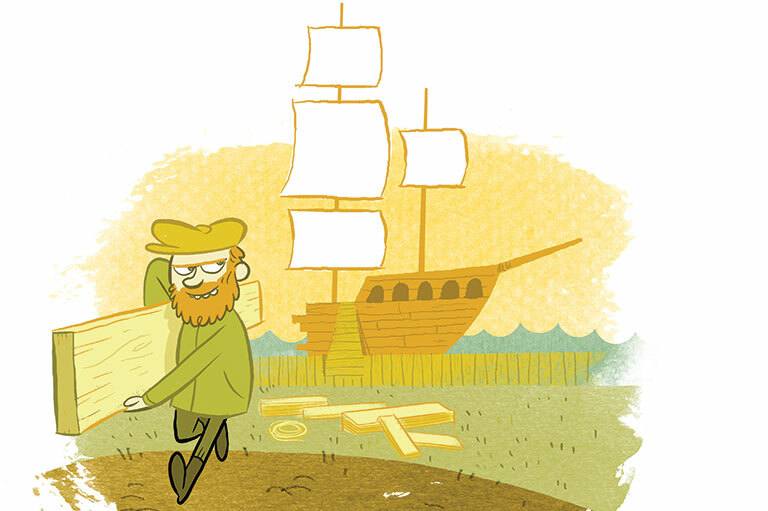 Imagine building an enormous sailing ship for no other reason than to rip it apart! In the early 1800s, colonists in Canada were earning big bucks exporting timber to Britain. Then the British government put a super-high timber tax on oak and pine. This meant less money for the colonists. But a few sneaky thinkers came up with a way to avoid paying the tax: disposable ships! These ships would be built with squared timbers, sailed across the ocean, and then quietly taken apart in Britain. Presto: timber delivered, with no tax to pay! In 1825, a huge disposable ship named the Baron of Renfrew made the voyage to Britain and was broken up for timber there. The operation was a success! What has two humps, a major appetite, and smells really really bad? A Cariboo camel! Back in the 1862, a herd of camels was brought to British Columbia to haul freight during the Cariboo gold rush. Some B.C. 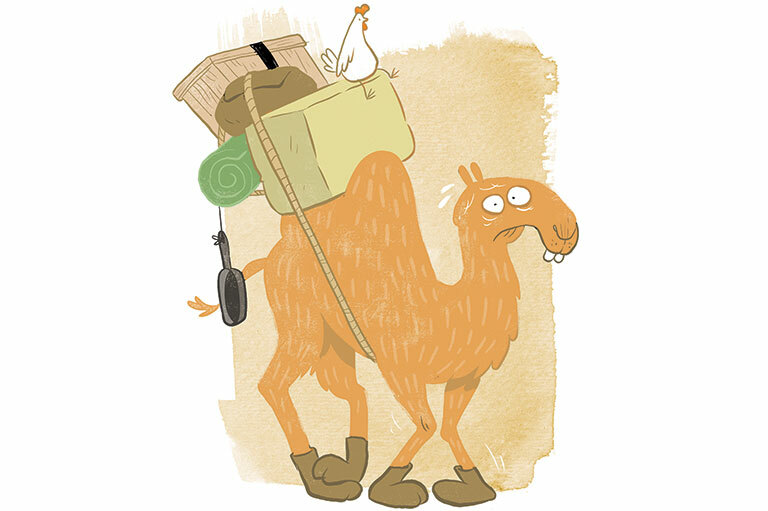 businessmen believed these camels would be able to carry heavier loads and travel longer distances than the mules and horses already on the job. But it turned out that the camels weren’t such a good idea. They kicked and bit at anything that moved. They ate everything in sight (including pants and bars of soap). And their terrible smell caused other pack animals on the trail to panic and stampede. About four months after the camels arrived in B.C., they were banned from the Cariboo trails for good. Nope, it wasn’t a ferryboat just for horses. It was a ferryboat powered by horses. In the early and mid 1800s, horse ferries were used in parts of Canada to carry people and supplies across various lakes. Each ferry was equipped with two to five horses that walked on treadmills located right on the boat deck. 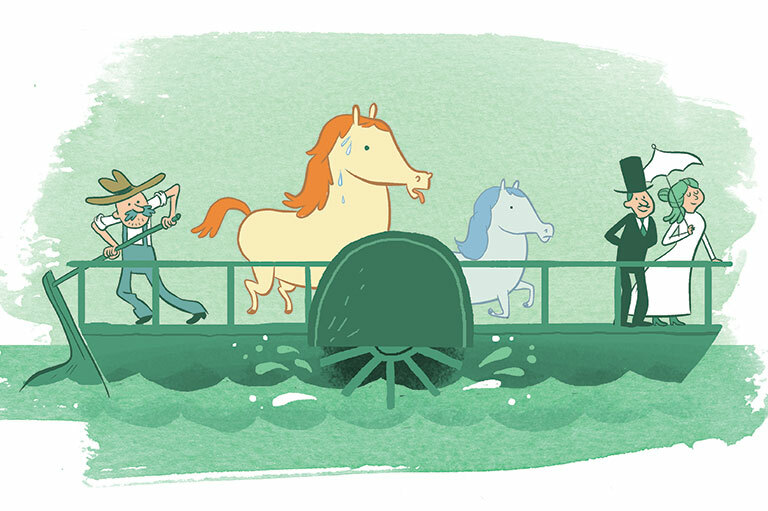 The treadmills were attached to side paddlewheels, which were set in motion when the horses moved. As the wheels turned, the boat was propelled forward. Canada’s horse ferries didn’t move very fast and could only be used for short trips. But they got the job done… until much speedier steam-powered ferries took over! Think you could maneuver a tiny boat through a sea choked with brutal, shifting pack ice? It would be an extremely tough challenge, not to mention dangerous. 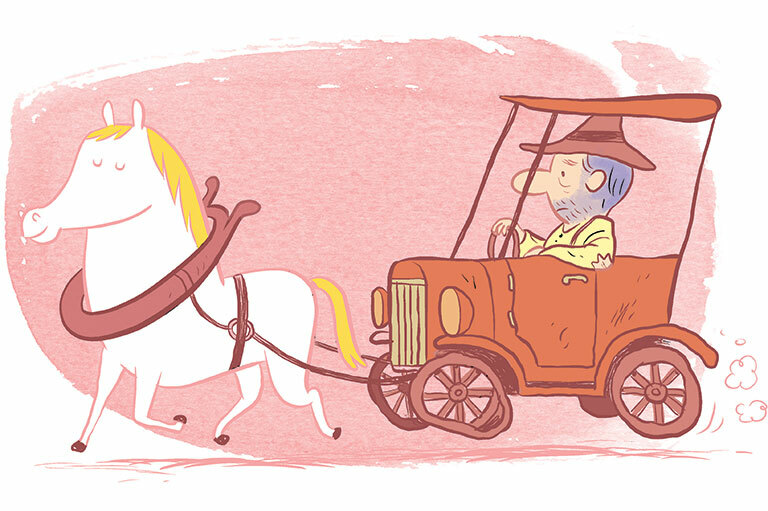 But in the 1800s, it was pretty much the only way to ferry goods and people between P.E.I. and mainland Canada in winter. To make the trip a little easier, ice boats were used. 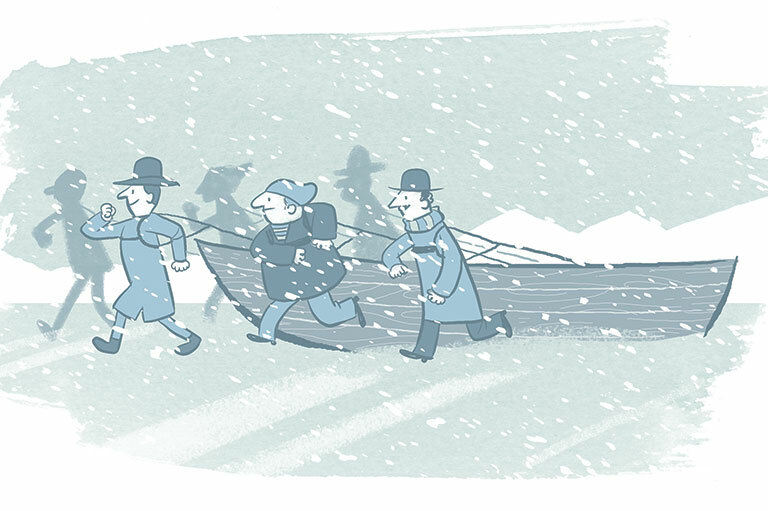 An ice boat was a lot like a regular rowboat, but with some special additions. Each boat was outfitted with runners on its hull and leather harnesses attached to the bow and stern. Whenever the boat met thick ice, crew and passengers alike got out, strapped on the harnesses, and dragged the boat over the ice and slush. If people fell into the frigid water as they pulled, the harnesses also helped save them from drowning. In the early 1930s, most Canadians experienced serious hardship. They suffered through the Great Depression — an economic crisis that lasted ten years. All across Canada, large numbers of people were poor and unemployed. Many who owned cars didn’t have enough money to operate them. Gas, oil, and repairs were just too expensive. But in the Prairie Provinces, poverty-struck farmers came up with a creative way to keep their cars moving. They took out their car engines and used horses to pull the vehicles instead. These cars towed by horses were nicknamed Bennett Buggies, after Richard Bedford Bennett, the Canadian prime minister of the time. During the First World War, a scientist in Britain had the idea of building huge ships out of ice and sawdust. He figured such ships would be indestructible. If bombed by enemy submarines, they could be repaired simply by freezing more water into place! The scientist shared his theory with the British government. Soon, a plan was hatched to try making one of these ice ships — in Canada! In 1943, deep in the mountains of Alberta, a group of men began building the prototype on the shores of Patricia Lake. The ship, named the Habbakuk, was eventually considered seaworthy. But by then, officials had figured out that ice ships were actually too expensive to build. They gave up on the whole idea. 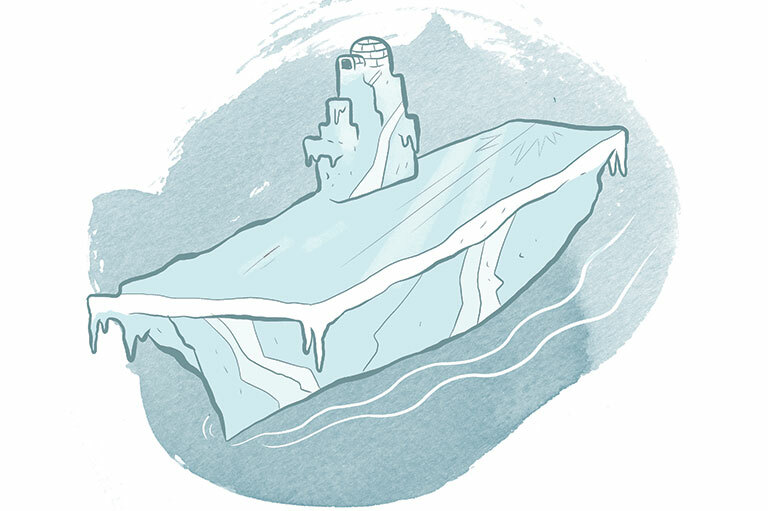 The Habbakuk soon melted away, and its wooden forms sank to the bottom of the lake. This may be hard to believe, but Canada was once home to a flying saucer! In the 1950s, Canadian scientists in Malton, Ont, began building a top-secret, disc-shaped aircraft for the United States military. It was hoped that this aircraft, known as the Avrocar, would be able to climb vertically and travel at supersonic speed. The military believed such an aircraft would be useful in combat. Unfortunately, the Avrocar didn’t deliver. During test flights, it couldn’t rise any higher than one metre in the air. Worse, it became very unstable once it left the ground. Funding for the Avrocar ran out before engineers could fix its flaws. By the early 1960s, the whole project had been abandoned. It looked kind of like a giant cigar. Or a huge rolling pin. But it was actually Frederick Knapp’s Roller Boat! Frederick Knapp was an Ontario lawyer and inventor. 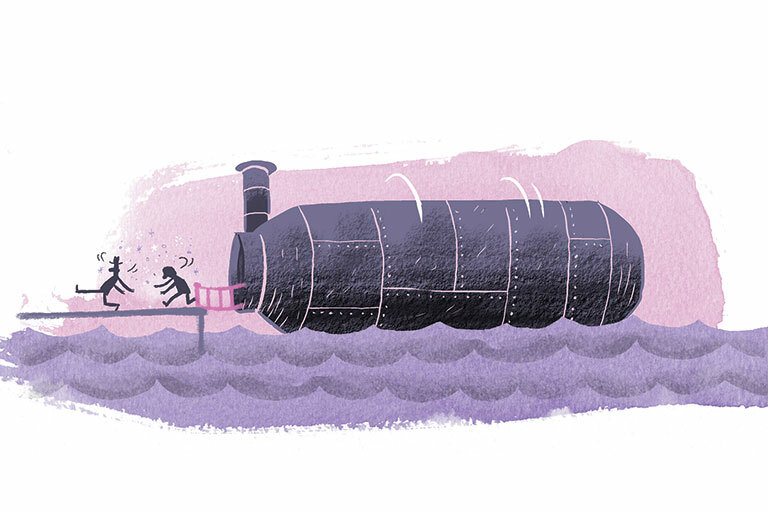 In the 1890s, he had an idea to build a big boat that would roll gently over any size of wave. After years of hard work, he finally finished his Roller Boat. It consisted of two large cylinders — one inside the other. The outer cylinder rotated on the water with the help of gears and chains that were connected to steam engines. Meanwhile, the inner cylinder, which carried passengers and freight, remained stationary. The Roller Boat turned out to be very slow and hard to maneuver. After several disappointing test runs, Knapp eventually lost interest in his “giant cigar” and left it alone to rust in peace. This article originally appeared in the May/June 2009 issue of Kayak: Canada’s History Magazine for Kids. There’s no doubt about it: Canada has produced some awesome inventions. Here are the stories behind our favourites. Sixty creative, innovative and sometimes mind-boggling contributions Canadians have made to the world. A descendant of a family who survived the sinking of the Empress of Ireland talks about a disaster that no one wanted to remember.